Cain and Mabel are two of the cutest, little Chihuahua puppies you will ever see. At 10 weeks old, they have had their first two sets of puppy shots been wormed and have been spayed and neutered. Both are very playful and looking for a good home. Come out to Barely Used Pets Rescue at 2790 E. U.S. Route 36, Urbana, Ohio, to play with Cain and Mabel or to look at any of our other adoptable dogs. All adult dogs have all been spayed or neutered, heart worm tested, vaccinated, wormed and are also treated with flea, tick and heart worm preventative. Check us out on Facebook for a first look at our new arrivals and adoption match-ups. For a complete listing of available pets, please see petfinder.com or our website, www.barelyusedpets.com. Our phone number at Barely Used Pets is 937-869-8090. 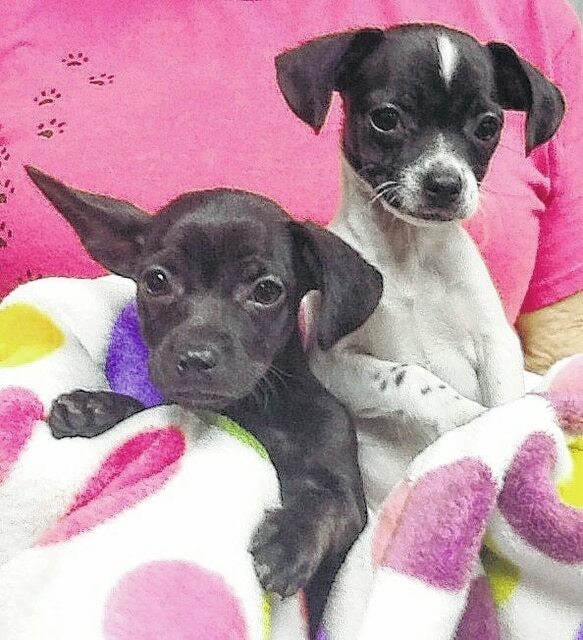 Cain and Mabel are two of the cutest, little Chihuahua puppies you will ever see. At 10 weeks old, they have had their first two sets of puppy shots been wormed and have been spayed and neutered. Both are very playful and looking for a good home. Come out to Barely Used Pets Rescue at 2790 E. U.S. Route 36, Urbana, Ohio, to play with Cain and Mabel or to look at any of our other adoptable dogs. All adult dogs have all been spayed or neutered, heart worm tested, vaccinated, wormed and are also treated with flea, tick and heart worm preventative. Check us out on Facebook for a first look at our new arrivals and adoption match-ups. For a complete listing of available pets, please see petfinder.com or our website, www.barelyusedpets.com. Our phone number at Barely Used Pets is 937-869-8090.